The knee joint is the largest joint in the body, connecting the femur (thigh bone), the tibia (shin bone) and the patella (knee cap). It is a weight-bearing joint that allows the leg to bend. The surface where one bone meets the other is covered by a spongy material called cartilage. It acts as a shock absorber and it is lubricated by joint fluid that ensures low friction in the joint. 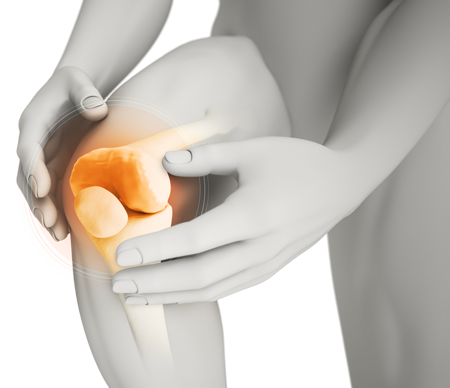 Pain in the knee joint is a common condition that affects people of all ages. This pain can be caused by a sudden injury, an overuse injury or an underlying condition such as arthritis. The condition of the articular knee cartilage itself and that of the underlying bone are highly intertwined, and, when assessing a painful knee joint, there are many reasons to focus on the entire cartilage and bone unit, instead of just focusing on the surface alone. Cartilage has no pain fibers and therefore it cannot be the source of any pain. The bone beneath the cartilage, on the other hand, is richly innervated with pain fibers. Accumulation of fluid in the bone marrow resulting in increased pressure is a common explanation of the pain. A painful cartilage lesion is often accompanied by a bone lesion, or at least a reaction in the bone. Thus, it is important to carefully consider the condition of the underlying bone in the diagnosis of an articular cartilage damage in order to identify possible reasons for pain and select a treatment method that will provide the patient with a pain-free joint. Lesions in the cartilage, such as e.g. cracks, can extend all the way to the underlying bone and thereby expose the bone. 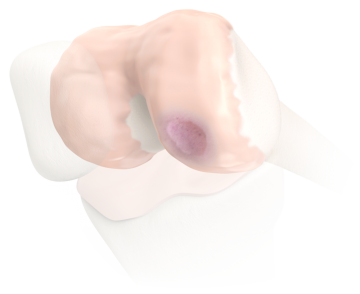 These lesions can be followed by one or more bone cysts (a blister in the bone underneath the articular surface) and other damage to the bone under the cartilage layer. A cartilage lesion can occur together with a reaction in the underlying bone, such as an underlying bone bruise (bone edema). The cartilage lesion can extend partly through the cartilage or all the way to the underlying bone. Osteonecrosis is a joint disease that is caused by reduced blood flow to bones. Due to this insufficient blood flow, the bone starts to die and break down. Although the overlying cartilage can initially remain intact, it generally deteriorates with time.